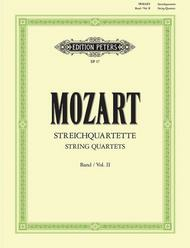 String Quartets, Volume 2 composed by Wolfgang Amadeus Mozart (1756-1791). For string quartet (2 violins, viola, cello). Classical Period. Difficulty: medium. Set of performance parts (parts only, score not included). Thematic index and introductory text. 299 pages. Published by Edition Peters (PE.P00017).With thematic index and introductory text. Classical Period. 9x12 inches.Contents: K155-160, 168-173, 285, 298, 370, 525, 5462 Violins, Viola, Violoncello (set of parts).